Today I wanted to do a blog post on how to look for the top 10 main signs of scoliosis. It can be very hard to detect scoliosis, especially if someone has an 'S' shaped curve, this is because the curve can be counter balanced, whereas a 'C' shaped curve can sometimes be more easily noticed as it doesn't have a counteracting curve. For most scoliosis patients, back pain doesn't occur too often, however in some severe cases back pain can be present. Back pain is quite an obvious tell tale sign in which you can personally notice, if you do experience back pain, it's well worth the visit to the doctors even if it isn't scoliosis they could be another underlying condition or disease. The primary tell tale sign is the development of an adnormal curvature within the spine. This transition is usually a very gradual process, and is often overlooked until more prominent. Scoliosis may cause the head position to appear crooked or out of line, the position of the head typically becomes unstable, gradually, over time as the corkscrew pattern of the vertebrate beigins to overlap and the spine becomes increasingly distorted. In addition to the head becoming off-centred, scoliosis patients may also experience changes in the placement of their hips and shoulders. For instance one shoulder may appear higher than the other. This throws off the entire balance of the upper body. The unevenness of scoliosis may also originate in the ribs. This typically occurs in patients with severe curves. This may throw of the balance of the ribs causing one to be more prominent than the other. people affected by scoliosis, may notice that as their curvature becomes more pronounced clothing may start to hang differently than before, this is because if your curve causes you to lean on way or another it will naturally cause clothing to hang that way too. This is quite a good way to tell if you have scoliosis by checking if the clothing you are wearing hangs the way it should. This usually occurs in those with severe scoliosis. This is because as the condition progresses the curve can put pressure on your lungs, heart and chest, this pressure can cause the lungs to become compressed and stop them from operating sufficiently, resulting in shortage of breath and even chest pain. This links to the above in the sense that if your spinal distortion compresses the lungs making them work harder, it can lead to a loss of sleep throughout the night. people with scoliosis, typically walk with a rolling gait. 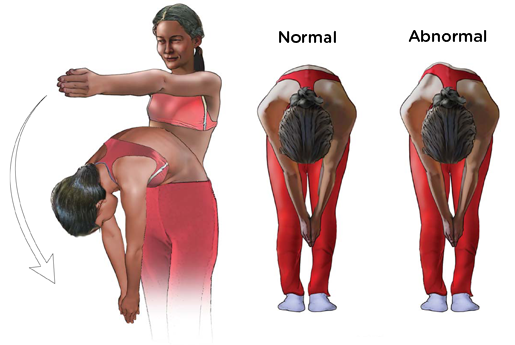 The distinctive roll from side to side when walking or moving often becomes very pronounced during the later stages of the disease due to the out of line positioning of the spine and hips. - back braces, these are commonly prescribed if the patient is still growing to prevent and reduce further movement of the spine. Adjustable back braces or Boston braces are the most common braces given out as they can be adjusted as a child grows. - physical therapy, this treatment may be used to teach exercises and techniques, as well as employ massage therapy, to help encourage corrective spinal alignment. physical therapy treatments may also be applied in collaboration with a back brace or following scoliosis surgery. - Scoliosis surgery, scoliosis surgery is often a last resort for scoliosis patients, and is the best way to receive an close as possible correction. The surgery entails inserting titanium metal rods and screws into the bones in the hope to hold the spine in proper alignment. Thankyou so much for reading everyone and I really hope you have learnt something from this post. If you have any questions about scoliosis, please feel free to comment below and I will respond as soon as possible.